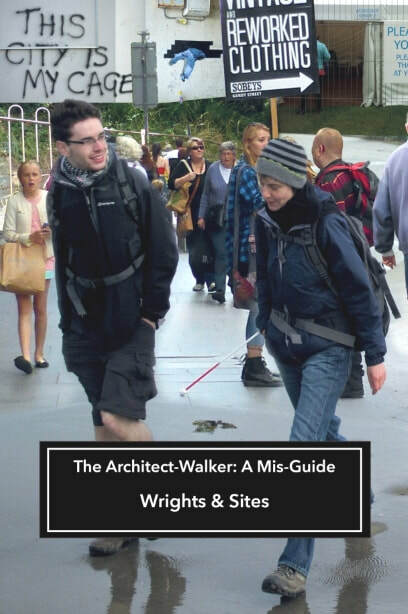 "Architect-Walker: A Mis-Guide explores what it means to walk with the “architecture” of a space in mind without allowing the built architecture (physical, mental, stated history) of the space to interfere with our observations. The goal of being an architect-walker is to reimagine the fullness of a place, a fullness that is not limited by the observed myth (environment & accepted story), but one that is open to what is unobserved and unspoken, to all the unrealized potentialities of the place—past, present, and future. The goal of Architect-Walker: A Mis-Guide is to see everything present – past, present, and future — as porous layers that allow each layer to flow into the other in a way that causes up to speculate, to imagine, and to reimagine/re-image. ...Merely listing them does a disservice to both the book and the tools. Interspersed throughout the pages are lists of performance suggestions. In between are actual performances that have taken place. Each performance is described and explored. Each exploration further expands what being an architect-walker is all about. Sometimes this expansion of meaning is a few words given as part of the chapter on the performance. Other-times it is a deeper exploration of what it means to be an architect-walker. In these topics such as “leaving the building,” privilege, vulnerability and power are explored. Whether it is from the description and exploration of the performances or from the examination of what it means to be an architect-walk, one thing becomes very clear: Being an architect-walker is not a passive experience. It is an active experience that both feels the place and allows that feeling to change our perception of the place. The place becomes significant in entirely new ways. " "the mythogeographic photographer is a “see-er,” a “seer” if you will. Not a fortune teller, but rather a seer in the original meaning of the word, “a person who see something specified” within what they are seeing. In other words, meaning. But not just meaning—a seer sees meaning that is disruptive to the expected, to the status quo, or what Phil Smith calls the “accepted myth.” A seer sees, as Phil would say, with a “fidelity to the indecipherable.” That, of course, raises the question how can I as a photographer see with a “fidelity to the indecipherable”? How can I create an image that is faithful rendition of the indecipherable?" "• Often I will stand in a vacant lot and have a conversation with the lot, wondering what the vacant lot and buildings on either side saying to each other. I wonder what they have going on? • There is in me some sort of empathy for the decaying and dead zones. I try to feel their pulse (or lack of pulse) and their emotions. I try to hear what they are saying. But to understand, I must also search out the thriving zones for they also speak and in so doing often illuminate what the decaying and dead zones are saying. • “Hazards” are something I consciously add to my wandering. Rather than taking the simple, the obvious path, I will choose the more difficult one. I find that this not only changes what I see, it often challenges how I see. • I let my imagination wander along with my feet. I wonder about what was once there. Why it is no longer there. Why what is there is there. Even, what might be there in the future. I often try to layer these images on top of each other to create a multi-layered image and then seek to create it as the end product of the photo-image. • Reflections, I love reflections, the stories they tell. I shoot through windows. I savor dirty windows. I seek imaginary ghosts. Frequently when I shoot through a window, “ghosts” appear in the image. Not how did they get there, but why (in a meta sense) are they there? What are they saying? • Shooting sitting down, lying down, shooting through my legs, from a wheelchair or out a dirty window changes both how I see and what I see. Likewise, I often shoot from positions and angles that I would not normally shoot from. • Sometimes I try to put my mind in an imaginary liminal space that is not here nor there, one thing or another, and then shoot from that space. • This is a fun one for me. It always makes me see differently. I take someone with me and shoot through there eyes at what they see from the space they point out. What makes it fun is that more times than not we each see something different in the image, and we each learn through the other’s eyes. • I am still working on: The carrying of an imaginary photo image in my mind and taking shots that conform to that imaginary image. • Have no agenda, other than an agenda to make images. I find that when I predetermine what shots I want to take, I rarely get anything that speaks to the photographer-architect-walker in me. It is those fortuitous shots that I come upon that do so."